The Sumatran rabbit weighs about 1.5 kg (3.3 lb) and lives only in remote mountain forest. It is completely nocturnal, hiding during the day in dark places at the base of trees, in burrows (not of its own making), or holes in the ground. This rabbit subsists on a diet of leaves and stalks from forest understory plants. The Sumatran rabbit apparently was never abundant anywhere in its range. It is restricted to montane forest in the Barisan Mountains, in west and southwest Sumatra, Indonesia, with one record in 1972 from Guning Leuser National Park in northwest Sumatra. The major threat is elimination of its forest habitat for cultivation, especially tea and coffee plantations. 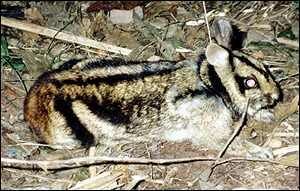 *** The Sumatran rabbit is apparently the world's rarest rabbit. Until recently, there had been only one confirmed sighting since 1916, in 1972. Then in early 1998, a team from Fauna and Flora International photographed one of these rabbits in Mt Kerinci National Park, in Sumatra, by means of phototrapping. *** Local people have no name for it and are unaware of its existence. *** Rabbits (belonging to many different genera) vs. Hares (all in the genus Lepus): The major differences between rabbits and hares include: 1.) their methods in avoiding predators (rabbits hide in dense vegetation or burrows; hares have longer legs and try to outrun predators), and 2.) the characteristics of their young at birth (newborn rabbits ("kittens") are born naked and with their eyes closed; newborn hares ("leverets") are better developed - their eyes are open and they can move around with some degree of coordination) (Macdonald 2001). 2004: Occurs in Indonesia (Sumatra) (IUCN 2004). The Sumatran rabbit apparently was never abundant anywhere in its range. It is restricted to montane forest in the Barisan Mountains, in west and southwest Sumatra, Indonesia. There is one record in of this rabbit in 1972 from Guning Leuser National Park in northwest Sumatra and one phototrapping record of one in 1998 from Mt Kerinci National Park, Sumatra. The major threat is elimination of its forest habitat for cultivation, especially tea and coffee plantations. The Sumatran rabbit weighs about 1.5 kg (3.3 lb). The Sumatran rabbit lives at an altitude of 600 - 1600 m (2000 - 5200') in dense montane forest on rich volcanic soil. The Sumatran rabbit is one of the species that live in the Sundaland Biodiversity Hotspot (Cons. Intl.) . The Sumatran rabbit feeds on the stalks and leaves of plants which form forest understory. It does not feed in openings or clearings. The Sumatran rabbit is nocturnal and hides during the day in dark places at the base of trees, in burrows (not of its own making), or holes in the ground.